Sinterklaas also known as Sint-Nicolaas has folkloric and historical origins based on Saint Nicholas. Unlike Christmas, Sinterklaas is celebrated on the fifth of December in northern provinces in the Netherlands and on the morning of the sixth (Saint Nicholas Day) in southern provinces. Sinterklaas is also celebrated in territories of the former Dutch Empire such as Bonaire, Suriname and Aruba. 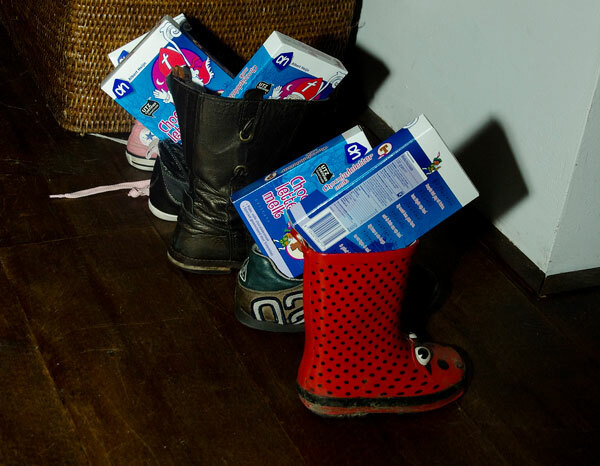 Sinterklaas is the primary source of the popular Christmas icon of Santa Claus. Thie resemblance can be seen in the image above. He traditionally rides a white horse. He carries a big, red book, called ‘The Book of Sinterklaas‘, in which is written whether each child has been good or naughty in the past year. Zwarte Piet (in direct translation: Black Pete) is usually portrayed by a man in blackface with curly hair dressed up like a 17th-century page in cheerful attire. Just how Santa Claus has his elves to help him Sinterklaas has his Piets. The origin of Sinterklaas and his helpers has been linked by some to the ‘Wild Hunt of Wodan‘. In this story, Sleipner flew through the air as the leader of the Wild Hunt riding on the white horse accompanied by two black ravens. The ravens just like Black Pete would wait on the chimney to tell Wodan about the good or bad behavior of the children for that year. Sinterklaas and Zwarte Piet are typically depicted carrying a bag which contains candy for nice children and a birch rod (a chimney sweep broom made of willow branches) used to spank naughty children. 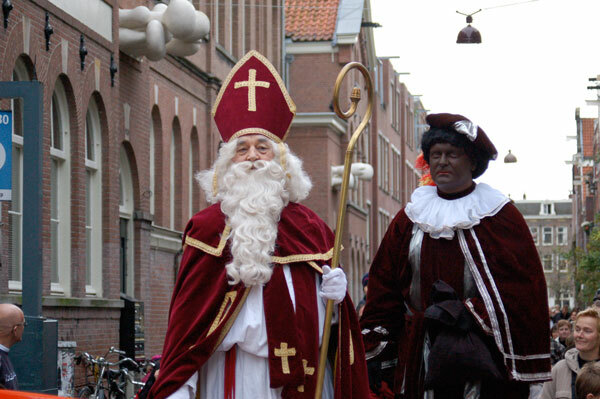 In modern times, Sinterklaas has developed a Black Pete for every function: there is a head Pete, a navigation Pete to navigate the steamboat, a packing Pete to pack all the gifts and an acrobatic Pete to climb roofs and stuff presents down the chimney. Over the years many stories have been added and Black Pete has developed from a somewhat unintelligent helper into a valuable assistant. Traditionally, Zwarte Piet’s face is said to be black because he is a Moor from Spain. Today, some prefer to say that his face is blackened with soot because he has to climb through chimneys to deliver gifts for Sinterklaas. The figure is considered by some to be racist. As such, the traditions surrounding the holiday have in recent years been increasingly controversial. There have been numerous editorials, debates, documentaries, protests and even violent clashes at festivals concerning this matter. A 2013 survey indicates that 92% of the Dutch public did not perceive this as racist or associate it with slavery, and 91% were opposed to altering the character's appearance. 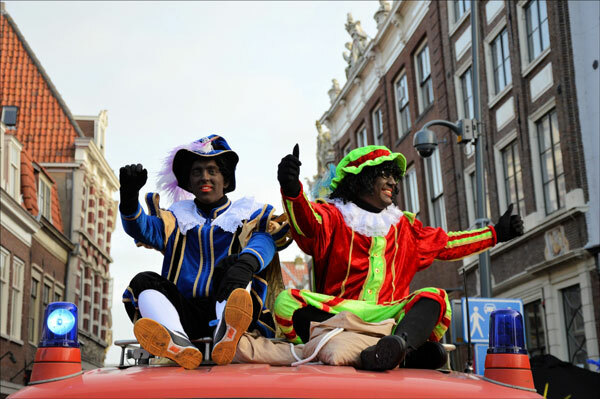 Nevertheless, both Zwarte Piet and the holiday remain popular in the Netherlands. 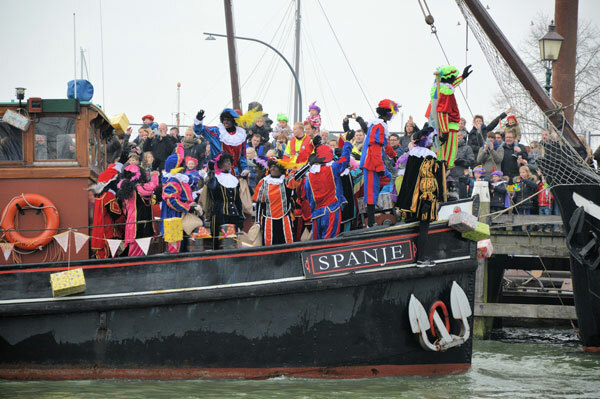 The festivities traditionally begin each year in mid-November (the first Saturday after November 11th), when Sinterklaas supposedly arrives with a steamboat at a designated seaside town from Spain. The steamboat anchors welcomed by children cheering and singing traditional Sinterklaas songs. His assistants throw candy and small, round, gingerbread-like cookies, either kruidnoten or pepernoten, into the crowd. The event is broadcasted live on national television in the Netherlands and Belgium. In places a boat cannot reach, he arrives by train, horse, horse-drawn carriage or even a fire truck. 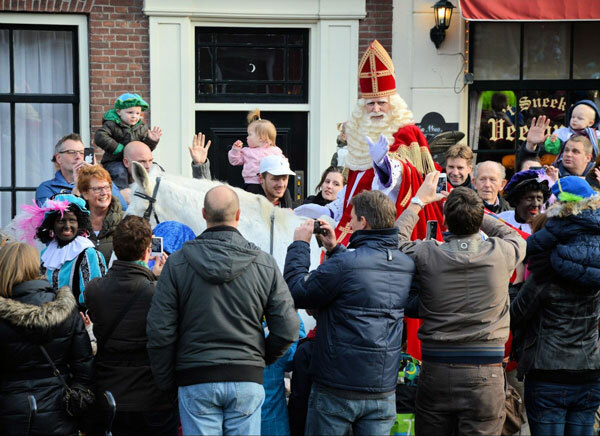 In the weeks between his arrival and 5 December, Sinterklaas also visits schools, hospitals and shopping centers. He is said to ride his white-grey horse over the rooftops at night, delivering gifts through the chimney to the well-behaved children. Traditionally, naughty children risked being caught and disciplined by his helpers. Before going to bed, children put their shoes next to the fireplace chimney of the coal-fired stove or fireplace. They leave the shoe with a carrot or some hay in it and a bowl of water nearby for the horse, and the children sing a song. The next day they find some candy or a small present in their shoes. In the Netherlands, the fifth of December is similar to Christmas Eve, and has become the chief occasion for gift-giving during the winter holiday season. The evening is called Sinterklaasavond (Sinterklaas evening). On this evening, the presents arrive and the living room is decked out with them, just as is done on Xmas. In Southern provinces in the Netherlands and in Belgium, most children have to wait until the morning of the sixth to receive their gifts (there the festivities is seen as a festivity almost exclusively for children). For the most part, it largely replaces Christmas as a gift-giving occasion, usually for as long as the children are living at home. The present is often creatively disguised by being packaged in a humorous, unusual or personalised way. Some will shift to Christmas Eve or Christmas Day for the present giving when the children get older. Sinterklaas is arguably the basis for the figure of Santa Claus. It is often claimed that during the war of independence, the inhabitants of New York City, a former Dutch colonial town (New Amsterdam), reinvented their Sinterklaas tradition, as Saint Nicholas as a symbol of the city's non-English past. In the 1770’s, the New York Gazetteer noted that the feast day of Santa Claus was celebrated by the descendants of the ancient Dutch families. However, this has been debated by many. No matter if you’re celebrating christmas or sinterklaas… Winter is coming (just pulling your leg). Tis the season to be jolly! Pine trees, mashed potatoes, gravy, candy canes and chocolate chocolate mousse (I could go on for a lot longer). So, what are you doing for your winter holidays? What do you have in mind for the family? Find some cheerful gifts right here.